Carl F. W. Borgward was an exceptional entrepreneur  the kind that easily survived the turmoil and upheaval of the second world war. Successful, headstrong, imaginative but ending up in a legendary bankruptcy in 1961, he had built virtually anything that might have four wheels and run on roads. 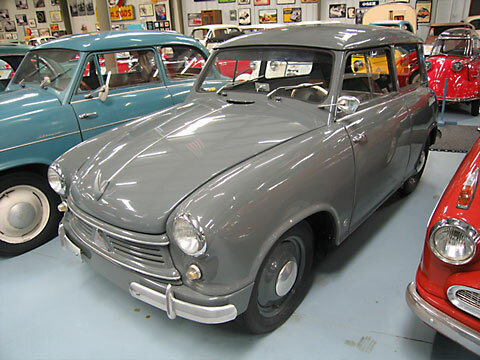 His company made both cars and trucks, and in addition to the names Borgward and Goliath, Lloyd had the largest variety of post-war models of any German manufacturer. Starting with the LP 300 in 1950- a year after the company was set up  Lloyd became established very quickly. The LP 300, which was affectionately known as the "Leukoplastbomber" (band-aid bomber), came with a plywood body covered with imitation leather. The wheels were large, the car itself sufficiently fast, and it had enough room for four persons. It was therefore much better than some rather too intimate cars, like the Isetta or Heinkel Kabine. From 1951 forwards, the LP 300 was also available as a convertible, coupe, estate and minivan. In 1954 the lower part of the bodyshell was supplied in metal and in 1955 the whole body followed suit. The "S" in 400S stands for "steel" body. By 1955 the Lloyd motor had reached a very grown-up 600 cc 4-stroke. The 400 2-stroke was delivered until 1957. Lloyd tried to keep up with the Joneses in the car industry. However, like other ambitious projects of the Borgward parent company, it accumulated a large amount of debt. After the bankruptcy in 1961,the Bremen plant was taken over by Siemens, among others. Weight: 480 kg Electrics: 6 v 4 Wheels: 4.25 x 15"